Today I had a quick, but lovely, lunch outside by the water here in the Bay of Kotor. 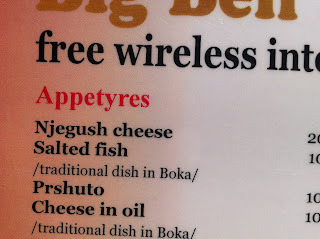 With the exception of “spaghetti bolognese” and a couple of other items, the Montenegrin menu was difficult to decipher. Yes, I know. I should be farther ahead than I am today. The kind and attentive server, aware of the selection challenge I was having, brought me the English menu. I ordered a dish which I knew had chicken in it, but I was not sure what else was coming. It ended up being a delicious spicy pasta dish with chicken and vegitables. Perfectly wonderful. 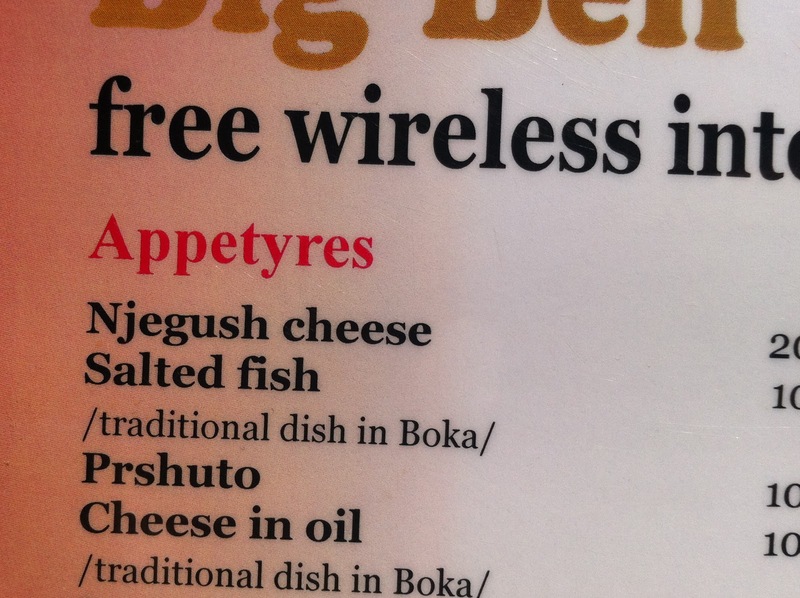 I am just glad that I did not select from the Appetyre section of the menu… chewy and bitter come to mind! I thought you might enjoy a couple of the other menu items I came across recently. How about Roast or Boiled Kid? Ever been puzzled about what do to on your next holiday? Each day in this amazing life experience I am reminded of how quickly this little nation on the Balkan peninsula has been launched into 21st century Europe and the Anglo-Saxon dominated world. I greatly respect how they are catching up so quickly. Little signs like these are great, and slightly comic, reminders of the great diversity of the world we live in and how important it is to respect that diversity.